This week kicks off the Department for International Trade’s Exporting is GREAT Export Hub Tour. 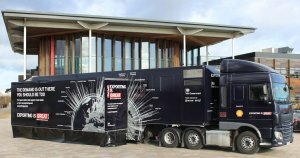 The Export Hub bus will travel the length and breadth of England across 9 locations, to meet with businesses looking to export into the US, delivering bespoke seminars, presentations, roundtables and one to one consultation catered to specific industry sectors, a raft of experts will be on hand to give advice on doing business in the US. As exclusive export delivery partners of the Department for International Trade, OCO Exporting UK and US Teams will be participating in the events. We will be there to provide information on the US markets’ needs for UK products and services, the planning process of entering a new market including logistics and costings and sourcing the right talent and partners. The US is the world’s largest market with lots of workforce talent and access to capital as well as having the ease of doing business from the UK with the many cultural similarities. Furthermore, with Brexit looming, now is the time for UK exporters to look beyond their current markets and consider expansion into new markets, such as the US. Our international teams have been involved in many export success stories into the US. We can help SMEs export beer from Towcaster to bars in Texas, to taking body wash from Manchester to the shelves of stores in Massachusetts, we have the knowledge and experience to answer all exporting questions no matter what stage of the process businesses find themselves. We have supported exports and market entry to over 40 different US states, and have specialists across various sectors who help over 100 companies a month, in the UK and beyond, to Assess, Enter and Grow in new markets. The Export Hub tour continues to the end of the month so keep your eyes peeled for Team OCO on the Department for International Trade and our own socials in the coming weeks!